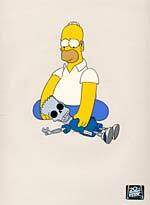 The Simpsons – This is a Hand-Painted Production Cel featuring Homer holding the skeletal remains of Bart…from the ‘Brother From The Same Planet’ epsiode, air date February 4, 1993. 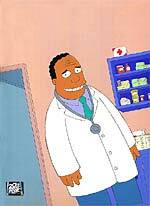 The Simpsons – This is a Hand-Painted Production Cel featuring a grinning Dr. Hibbert From ‘Brother From The Same Planet’ episode which aired February 4, 1993. The Simpsons – This is a Hand-Painted Production Cel featuring Bart skateboarding through spilled oil in the ‘Bart’s Girlfriend’ episode which aired on 11/6/94. This cel is accompanied by its matching Production Drawing. The Simpsons – This is a Hand-Painted Production Cel featuring Bart Simpson primping in the mirror as Homer looks on. This cel appeared in ‘Bart’s Girlfriend’ which aired on 11/6/94. This cel is accompanied by two matching Production Drawings.